One of the biggest video game releases is upon us. "The Elder Scrolls V: Skyrim" (ESRB Rated M) came out today. Like previous entries in the Elder Scrolls series, Skyrim promises a huge fantasy world to explore with near-infinite story possibilities, making each player's time with the game a unique experience. 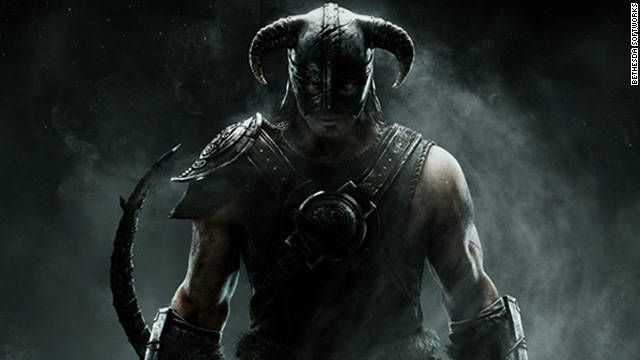 It will not be unheard of for gamers to spend 100 hours or more in the vast Skyrim universe. Talking to girls in real life is hard. Even if you manage to muster the courage to approach one, she just stares at you vacantly as your brain fumbles for the words to win her heart. Sound familiar? In Skyrim, girls still stare at you vacantly, but all the words you can say are predetermined, removing a great deal of social pressure. Plus, you get to talk about elves and crap like that, which a real-life girl would never subject herself to. Have you ever looked at rocks in the real world, only to find them just a bunch of boring, ordinary rocks? Not so in Skyrim! Every rock that you see in Skyrim has been lovingly hand-crafted by an experienced game developer using highly-sophisticated 3D imaging technology to ensure that the rocks in the game are even more rock-like than real rocks. "If you think the rocks are awesome, you should talk to our Senior Topsoil Designer," said Skyrim's Lead Rock Designer. Do you feel like you constantly have to convince others around you (friends, family, the old guy at the comic book shop) of the existence of things that everyone keeps telling you don't exist? But you know in your heart - deep down - that they do? Things like high-quality young-adult vampire fiction? Excellent nu-metal bands? Japanese animated television series with riveting, easy-to-follow storylines? If you are this type of person, then you may also believe that dragons could maybe, possibly, theoretically exist. You probably also believe in ghosts and mutants. If so, Skyrim will be a treat. Next time you enter a well-lit or semi-lit room, take a look around. Do the shadows look unrealistic? They probably do. And yet, we must accept these unrealistic shadows as part of our everyday existence. The creators of Skyrim, however, were not content to settle for ordinary, unrealistic shadows. Using Sunbeam Verisimilitude lighting technology and a proprietary Incandescent Luminous physics engine, Skyrim's developers were able to achieve the most realistic shadows ever seen in a video game, including some new kinds of shadows that only exist in the world of Skyrim. Too bad the rocks in this game, a long with just about everything else, reeks of 2007, with low-res textures and blocky modeling..
Also, the shadows? They are even going to bring them up after how horridly pixelated and buggy they are?